Professor Kwesi Yankah, president of Central University College, says the Mahama-led National Democratic Congress (NDC) government must restore the dignity of former president Dr. Hilla Limann. According to the linguistics professor, the narration about the presidency of Limann has over years been deliberately distorted for certain political advantage. Prof. Yankah, who was speaking in Accra yesterday at the launch of a biography of Dr Hilla Limann, scholar, diplomat and statesman,’ said government should also name some important monuments after Dr Limann to restore his dignity. Former President Dr. Limann, the only president of the third republic, was overthrown 34 years ago by ex-President Jerry John Rawlings on December 31 after being in office for 27 months. “I call on the Mahama government to restore the dignity of the presidency of Hilla Limann and help to erase associated indignities and silence. The tragedy of over naming monuments after only a couple of past presidents is an embarrassment to us as a nation. Ghana also belongs to the Limanns of history,” he said. 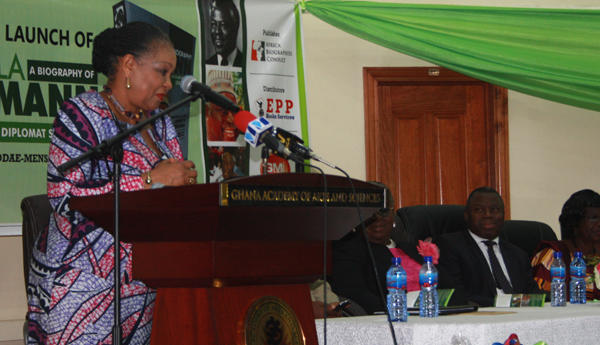 The 650 page-book was written by Emeritus Prof Addae-Mensah, former Vice-Chancellor of the University of Ghana. It was published by African Biographies Consult and distributed by EPP Books Services. He called on the government to rehabilitate the legacy of Dr Limann and give due entitlements to the family. “Ghana also belongs to their widows and families who due to an accident of history never enjoyed the entitlements and benefits of their late husbands and fathers who once occupied the high office of president. “We should arrest the continuous cueing of the national script in favour of political allies and leave for our children and future generations, a national script of all inclusiveness, a virtue Hilla Limann highly cherished and practiced while he lived,” he said. Fulera Limann, wife of the former President, expressed optimism that the book would set the records straight. “I therefore believe that almost 18 years after his demise, my husband’s prophecies have come to pass with the writing of this book. I have no doubt that this book will give account of my late husband’s legacy as a scholar, diplomat and statesman,” she disclosed. Prof Ivan Addae-Mensah said he wrote the book to tell the story of Dr Limann the way he knew and experienced it while working with him to correct the distortions. “Over the years, so many versions of events during the Limann administration have been told, most of which border on speculations and distortions,” Prof Addae-Mensah stated. The event was graced by Dr. Joyce Aryee, Samia Nkrumah, Alhassan Andani, Archbishop Palmer Buckle, Gifty Afenyi-Dadzi, Prof Agyeman Badu Akosah and Prof Ernest Aryeetey, among others.